Desiderius Erasmus Roterodamus was a Dutch Renaissance humanist priest of cAtholic faith who angered both his own church and Reformation members by preaching a middle path between the two philosophies. He would go on to become one of the most influential philosophers after his death. He stayed in this residence in the 16th century. While the focus of the museum is on the monk, there are also material related to his times, mostly paintings, but also books, the origins of printing, and philosophical gardens. There are two other gardens on the grounds - a medicinal garden and a second philosophical garden. Belgium’s smallest Beguinage, of the extant Anderlecht Commune, was formed in the 12th century. 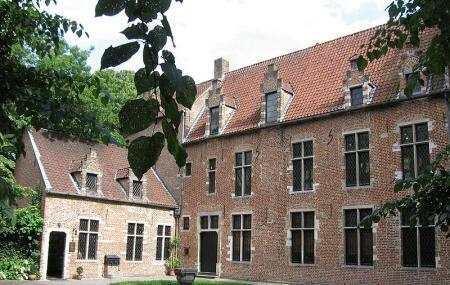 The museum of the Beguinage building focuses on Anderlecht history, archaeological artefacts, and religious art. Request guided tours by contacting the museum. How popular is Maison D Erasme? People normally also visit Museum Of The City Of Brussels while planning their trip to Maison D Erasme. Gorgeous ancient house and garden in the unlikely borough of Anderlecht, better known for football than culture... Don't miss their very interesting conferences, concerts and exhibitions. The 500 year old house is packed with old paintings, furniture and books. Most from the time period. Extremely beautiful and pristine with only a few visitors when I went on a Tuesday. Has a small museum dedicated to Erasmus, and a nice philosophical garden. The latter is rather nice in the summer. Staff wasnt kind at all. Asked us to put our bags in the office becoz of "security reasons". While the others were allowed to take it inside. As for the house itself. Worth the visit.